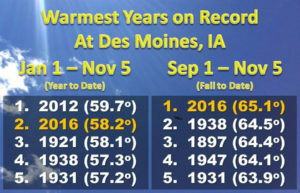 Despite some predictions of a colder, snowier winter ahead, 2016 is shaping up to be one of the warmest years on record for many parts of Iowa. Meteorologist Kurt Kotenberg at the National Weather Service, says we’ve been seeing above-normal temperatures in recent weeks in central Iowa, with atypical highs some days in the 60s and 70s. “So far, we do have the warmest fall on record,” Kotenberg says. 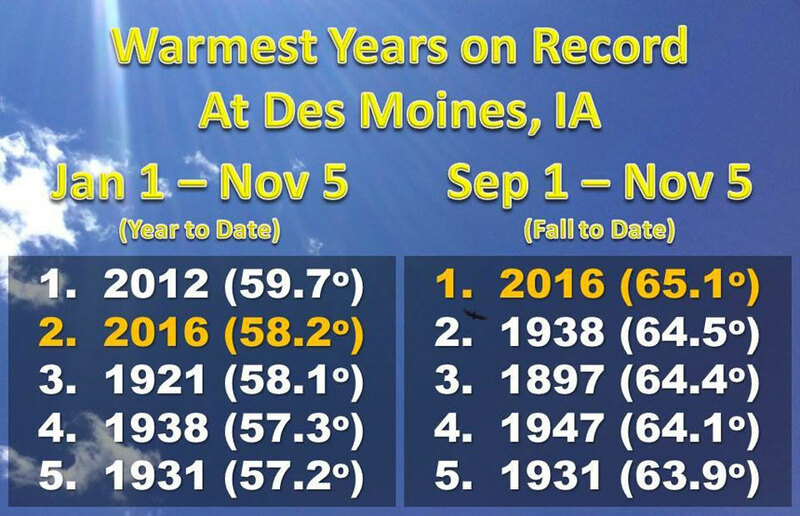 “From September 1st to November 5th, we have an average temperature of 65.1 degrees. Number 2, was 1938, 64.5 degrees.” It’s exceptional, considering weather records have been kept consistently here since 1878. Kotenberg says it’s likely we’ll end the year in the top two for the warmest weather. The NOAA Climate Prediction Center is forecasting roughly equal chances for above- versus below-normal temperatures and precipitation in the winter ahead, according to Kotenberg. The Climate Prediction Center recently issued a La Nina watch, predicting the weather pattern is likely to develop in late fall or early winter. La Nina favors drier, warmer winters in the southern U.S. and wetter, cooler conditions in the northern U.S.